The sharply styled new Mondeo features full-LED headlights and a panoramic roof. It features Ford’s new design language, with a trapezoidal grille and angular light clusters. The design is sleeker and sportier than the outgoing model, and Ford promises a dynamic drive. A broad range of drivetrains will be offered, and an all-wheel drive diesel model will be offered for the first time. The 1.0-litre EcoBoost engine will also feature, and a hybrid version, powered by a 2.0-litre petrol engine combined with a 35kW Li-ion battery, will be offered eventually. Four and five-door bodystyles will be available, along with an estate variant. The cabin features soft touch materials and premium details designed to rival the quality of more premium competitors, and there’s a SYNC system, which features an 8-inch touch screen and voice activation. It can also be used as a WiFi hotspot for as many as eight difference devices. Voice control works on the usual telephone system and radio, but also on climate control and sat nav. Safety has also been considered and the new Mondeo will be the first European model to feature inflatable rear seatbelts, which expand in the event of a crash to disperse crash forces and reduce friction. 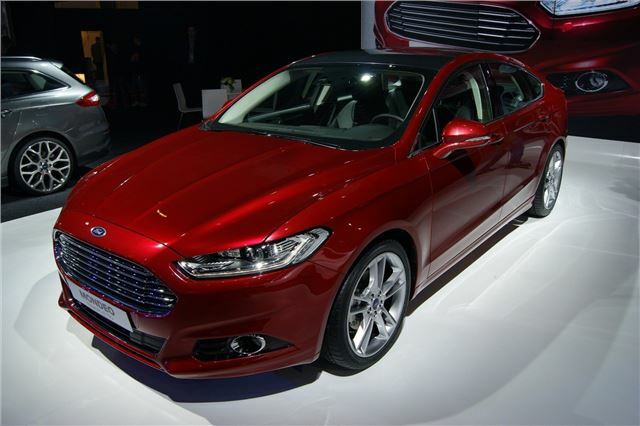 The new Mondeo will go on sale in Autumn 2013. Prices and further specification details are likely to be announced nearer the cars on sale date. New 1.0 litre engine for a Mondeo? Surely it's not a Reliant in disguise. I think I'll give that one a miss! looooooks the part but ford are following hyundai now not the other way round. Tiny engine working very hard? I don't think so, thanks.